Hagerstown was the main hub of the Western Maryland system. WM lines radiated to the east, north and west, and connecting roads came in from the north and south. Key interchanges were made with the N&W's Shenandoah Valley line, and the Penn Central's Cumberland Valley line. Run-through agreements of the Alphabet Route brought trains of the Reading Company over WM rails from Shippensburg, and N&W trains all the way from Connellsville to the west. AJ-2 races into Big Savage Tunnel behind N&W and WM pooled power. At Hagerstown the engines will be replaced with Reading and fresh WM equipment for the trip to Rutherford. Other interchange traffic came via the B&O at Cherry Run, through Hagerstown and on to the Reading along the Central States Dispatch Route, as well as from the B&O's Brunswick to Hagerstown branch line. 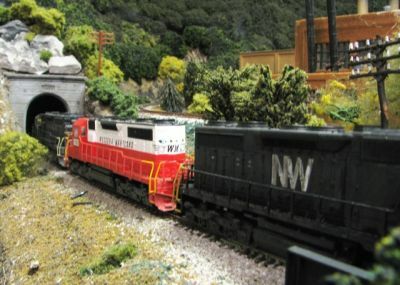 On the WM Western Lines layout, Ridgeley is the hub of operations representing yards at both Cumberland and Hagerstown, with trains representing the various interchanges working out of staging. East bound trains will include AJ-2, AJ-12 bound for Rutherford, PA on the Reading via Shippensbug and the Lurgan Sub. WM-6 will come in from the west and proceed to Baltimore, and Train HY will run fast freight through to York, PA. B&O power will bring the CSD trains in from Cherry Run to run through to Harrisburg. Westbound trains will include AJ-1 and AJ-3 from Rutherford through to Connellsville, BT-1 from Baltimore thru to Toledo, and YH, the turn back from York. Look for westbound CSD trains as well. There will also be a variety of coal trains, running between Elkins and Baltimore, Fairmount, WV via the Connellsville Sub, and through to Lurgan for markets in the northeast, especially the steel mills of Bethlehem and Allentown. This also provided the LRV with access to the vast coal fields around Somerset, which were served by the WM's branches at Gray. Under an operating agreement, the LRV became responsible for providing rail service to those mines, utilizing the WM's long-standing trackage rights agreement over the Johnstown Branch. The LRV also became a secondary line of the Alphabet Route, providing a connecting time freight from Latrobe to Cumberland, similar to HY-YH trains between York and Hagerstown. I also allowed for some minimal staging, so occasionally a Conrail grain train would snake around the layout, or a coal train. The Laundry Room was on the left, where the city scape and yard is. The return loop that appears to be a peninsula was on a hinged drop-down section, with a hinged integrated leg that came down when unfolded. The peninsula would clip to shelves above the layout with hook and eyes. 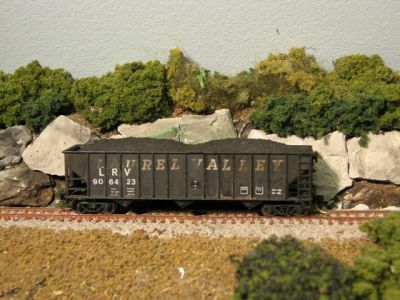 On the new layout, the Laurel Valley also provides coal that is particularly suited to power generation, so a fleet of hoppers like the one at right will also be making regular appearances on the layout. 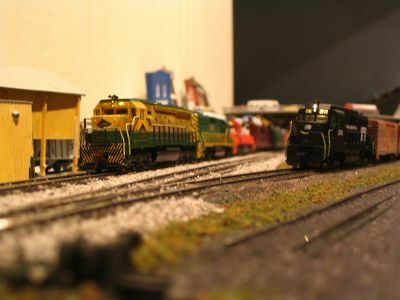 I have several more LifeLike GP-20's that I will re-paint into the Laurel Valley's green and yellow so that LRV pool power can help carry trains to Hagerstown. Watch this page for articles about the various interchange railroads that will be making appearances on the layout. Hagerstown was a busy place, providing a stopover for the Norfolk and Western, B&O, Penn Central (former PRR), and Reading railroads. At Elkins, cars headed for the C&O would head down the Durbin Branch, the farthest point on the WM. The Laurel Valley Railway is my old Freelance road, which ran from Latrobe, PA, across Laurel Hill to Somerset, then down the B&O Johnstown Branch to the WM at Rockwood. I plan to include LRV trains bound for Somerset in my operating scheme. AJ-1 arrives at North Junction as a Penn Central peddler waits for the main to clear. The WM operated trains from Rockwood to Gray, just above Somerset, via trackage rights over the B&O Johnstown Branch. That's a fact. There was a branch line railroad, the Ligonier Valley Ry. that operated from Latrobe to Ligonier at least into the 1960's. That too is fact. A tunnel was bored in the late 19th century for the purpose of building a railroad not far from Somerset. Another fact. While that tunnel was used as part of the Pennsylvania Turnpike in 1940, it was abandoned and bypassed in the mid-60's to relieve congestion on the highway. Yes, a fact indeed. Here's where we get creative. Instead of falling under the management of the Pennsylvania and being run into the ground by the Penn Central, the Ligonier Valley remained a viable branch line, living well off of the limestone quarries around Ligonier which fed fluxing stone to the open hearths of Pittsburgh. When the Turnpike Commission elected to bypass Laurel Hill Tunnel, the management of the Ligonier Valley, with financial backing from the C&O/B&O and the Western Maryland, negotiated to reopen the route as a new rail connection, allowing access to the quarries from the east, and an available secondary route across the Alleghenies. A Laurel Valley GP-20 prepares to head back to Ligonier Yard with time freight CL (Cumberland to Ligonier). A later version, around 1989, was much more elaborate. It included a detailed city-scape, a functional yard, and and engine terminal with a scratchbuilt turntable. This was also the first layout that enabled me to work out an operating scenario, and to experiment with car cards and waybills. I ran a B&O train and a Conrail train, each of which would deposit cars on a siding, then the LRV turn job came out of the yard with interchange cars "to go" and pick up the new set-outs for delivery on line. The LRV Switcher at Elizabeth. 1989. The backdrops were done with photos of model building clipped from Model Railroader and other publications. These were the days before scanners and color printers! Although the last LRV layout was "deconstructed" in 1993, it's spirit lived on, and I continued to model rolling stock for the railroad, assuming that someday it would be rebuilt. I had special dry transfer lettering printed in a variety of sizes, which enabled me to letter flatcars, hoppers, boxcars and others. I chose a lettering style similar to the WM's, and my engine colors were reminiscent of the Reading. The Laurel Valley connection also gives me an excuse to run my WM stone train on the layout. These trains actually operated only between Bittinger, PA (near Hanover on the Dutch Line) and Bethlehem Steel at Sparrows Point near Baltimore, so the grey stone hoppers never ventured off the East Sub under WM operation. The familiar grey Atlas 90 ton hoppers are a fair approximation of the actual cars, and I'm working on building a train of empties as well as a train of loads.